Draft: 2007, Boston Red Sox, 6th rd. Anthony is a three-time N.L. All-Star and in seven seasons with Chicago has batted .275 (1,036-for-3,774) with 225 doubles, 14 triples, 190 homers and 626 RBI in 1,012 games ... was acquired from San Diego in a four-player deal in January of 2012 ... His 190 home runs rank tied for 10th in franchise history with Hack Wilson ... his 626 RBI rank 20th in franchise annals while his 225 doubles are 22nd ... Is the first left-handed batter in franchise history with four 100-RBI campaigns ... Finished fourth in both the 2015 and 2016 N.L. Most Valuable Player voting ... Named the recipient of the 2017 Roberto Clemente Award, annually given to the player who best represents the game of baseball through extraordinary character, community involvement, philanthropy and positive contributions, both on an off the field ... Was the Cubs nominee for the Roberto Clemente Award in 2013, 2014, 2015, 2016 and 2017 ... Participated in the 2015 MLB Home Run Derby at Cincinnati's Great American Ball Park ... Has 16-career multi-homer games, tied for 11th-most in Cubs history ... Reached 30 doubles, 30 homers and 100 RBI in three-straight seasons from 2015-17 ... is only the fourth Cub ever to reach those thresholds in at least three seasons, joining Hack Wilson (4 times, 1927-30), Billy Williams (3 times, 1965, 1970, 1972) and Sammy Sosa (3 times, 1997, 2000-01) ... Has made six-straight Opening Day starts at first base for the Cubs dating to 2013 ... Has tallied six career post-season homers, tied for the most in Cubs post-season history ... In 2016, he recorded 79 extra-base hits, the most for a Cubs left-handed hitter since Billy Williams had a franchise-record 80 extra-base hits in 1970 ... Was the Cubs finalist for both the 2014 and 2015 Hank Aaron Awards, presented to the league's top hitter ... honored as the 2014 Branch Rickey Award winner in recognition of his work in the community with pediatric cancer patients ... Named one of six finalists for the Marvin Miller Man of the Year award in 2017 ... On May 13, 2013, signed a seven-year contract through 2019 including club options for 2020 and 2021 ... Played for Team Italy in the World Baseball Classic in March 2013 ... helped the team reach the second round ... Prior to his trade to Chicago, Baseball America named him San Diego's top prospect prior to the 2012 season ... Batted .303 with 137 doubles, 87 home runs and 343 RBI in 445 minor league contests covering six seasons ... Made his major league debut with San Diego in 2011 ... Was acquired by the Padres from Boston in December of 2010 as part of a five-player deal that sent Adrian Gonzalez to the Red Sox ... Limited to 21 minor league games in 2008 after being diagnosed with Limited State Classical Hodgkins' Lymphoma in late April ... Three times honored as the Cubs Heart and Hustle Award winner by the MLBPAA, in 2013, 2015 and 2016 ... Created the Anthony Rizzo Family Foundation in 2012 to help raise money for cancer research, and to provide support to children and their families battling the disease ... besides hosting multiple fundraisers in his hometown of Parkland, Fla., holds annual Cook-Off and Laugh-Off fundraisers in Chicago ... The Foundation donated $3.5 million to Lurie's Children's Hospital in August of 2017 ... Participated in the 2015, 2016 and 2017 Cubs Caravan events ... Graduated from Marjory Stoneman Douglas High School in Parkland, Fla. ... hit .468 with 48 RBI and 28 walks as a senior. Anthony became the first left-handed batter in franchise history to record four 100-RBI campaigns as he batted .283 (160-for-566) with 29 doubles, 25 homers and 101 RBI in 153 games ... became the first Cub with at least 100 RBI in four-straight seasons since Sammy Sosa (nine-straight from 1995-2003) ... Led the N.L. with 19 game-winning RBI, the first Cub to lead the league in that category since Sammy Sosa tied for the lead with 21 in 2003 ... Ranked seventh in the N.L. with 101 RBI and was ninth with a .376 OBP ... was third with 20 hit by pitches ... After batting .149 (11-for-74) with a .448 OPS in his first 18 games through April 30, he batted .303 (149-for-492) with a .905 OPS beginning May 1 ... Hit .297 (43-for-145) with four homers and 70 RBI with runners in scoring position ... Recorded a .995 fielding percentage (7 E/1,287 TC) in 153 games at first base ... Was placed on the disabled list for the first time in his career April 10 (retroactive to April 6) with lower back tightness ... was reinstated on April 17 ... Batted in the leadoff spot in 27 of 28 games from July 13-August 14 and led the N.L. with a .439 on base percentage during that span ... also ranked fourth in the league with a .340 batting average (35-for-103) ... Collected a season-high five RBI, May 9 vs. Miami, going 3-for-5 with two doubles, one homer and two runs scored ... Drove in a run in eight-straight games with an at-bat, June 2-11 ... was the first Cub to accomplish the feat since Moises Alou had a 10-game run, August 20-29, 2004 ... Drove in a run in 10-straight home games from May 25-June 19 (game one) ... was the fourth Cub since the RBI became an official stat (in 1920) to accomplish the feat, joining Ray Grimes (13 games, 1922), Hack Wilson (10, 1930) and Bill Nicholson (10, 1943) ... thanks STATS Inc ... Hit a game-winning solo homer in the 11th inning, June 11 at Milwaukee ... Collected his 1,000th-careeer hit, August 11 vs. Washington, with a single to right field in the third inning ... 16 days later recorded his 1,000th hit as a Cub with a seventh-inning double ... Hit his fourth-career leadoff home run, May 1 vs. Colorado, surpassing Rick Monday for the most-ever leadoff home runs by a Cubs first baseman ... Had a season-long 11-game hitting streak from May 18-29 ... went 16-for-42 (.381) with four doubles, two homers, 14 RBI, 10 walks and six runs scored during the stretch ... Recorded a career-high tying four hits, going 4-for-5 with two doubles and three RBI in the Cubs' 11-5 win over the Dodgers on June 28 ... Reached base in eight of 10 plate appearances in the doubleheader vs. St. Louis on July 1, going 5-for-7 with a triple and three walks ... became the first Cubs batter to reach base eight times in a doubleheader since Mark Grace in 1995 ... Became the fourth Cubs leadoff hitter since 1907 to reach safely at least four times in three-straight games, July 21-22 vs. St. Louis, and the first since Brian McRae in 1996 ... Made his first-career pitching appearance with two outs in the ninth inning of the Cubs 7-1 loss vs. Arizona on July 23 ... threw two pitches and forced A.J. Pollock to fly out to center field ... Played in his 1,000th game and hit his fourth-career walk-off homer in the Cubs' 7-6 win vs. Arizona on July 26, going back-to-back with David Bote ... his first walk-off homer since September 15, 2014 vs. the Reds ... Went 2-for-4 with three RBI, including a two-run homer, and tied his career high with two stolen bases in the Cubs 8-4 win vs. Milwaukee on August 15 ... batted in the cleanup spot for the first time since July 11 ... Hit a homer in three-straight games, August 21-23, one shy of his career-long streak ... Batted .414 (12-for-29) with four doubles and five RBI in eight games from September 23-30 ... tied his career high with four hits, September 30 vs. St. Louis. Anthony posted career-highs in OBP (.392) and runs scored (99), while tying his career-high marks in homers (32) and RBI (109) ... appeared in a team-high 157 games, his fifth-consecutive season of at least 140 games... Ranked among N.L. leaders in homers (32, 9th), RBI (109, 5th), runs (99, 9th), total bases (290, t-9th), walks (91, 4th), OBP (.392, 10th) and hit-by-pitches (24, 1st)... Batted .319 (90-for-282) with a .436 OBP in 80 home games compared to a .228 average (66-for-290) with a .349 OBP in 77 road games... Hit 10 homers off left-handed pitchers, tied for second-most in the majors by a left-handed batter, trailing only the Dodgers' Cody Bellinger (12 homers)... Excelled against the Reds, batting .333 (22-for-66) with seven homers and 23 RBI in 18 games ... the 23 RBI are tied for the third-most all-time by a Cubs player against the Reds in a single season... Batted .355 (39-for-110) with nine doubles, seven homers, 30 RBI, 25 runs and 13 walks in 29 August games ... his 30 RBI were the most by a Cubs player in any month since Sammy Sosa's 36 RBI in August of 2001... Was named N.L. Player of the Week for August 14-20 after batting .429 with five runs, three doubles, two homers, 13 RBI, a .484 OBP and a .759 slugging mark in seven games ... was his second-career weekly honor... Had two hitting streaks of at least 12 games, including a career-high 14-game hitting streak from June 6-20 ... hit .420 (21-for-50) with five doubles, five homers, 17 RBI and a .524 OBP during the streak... Homered in three-straight games, April 21-23 and July 15-17 ... the only Cubs player to homer in three-straight games on the season... Connected on a first inning grand slam, August 16 vs. Cincinnati ... marked just the third time in franchise history that the Cubs cleanup hitter hit a grand slam in the first inning with no outs, joining Hank Lieber, September 12, 1939 vs. Boston and Bob O'Farrell, June 14, 1923 vs. Brooklyn... Batted leadoff for the first time in his career in 10-straight games from June 13-23, and reached safely in each of his first seven contests to lead off a game (HR, HR, BB, 1B, 2B, 1B, HR) ... became the only player in the last 60 seasons to reach in his first plate appearance in each of his first seven career games hitting leadoff ... was one of 26 major leaguers with at least three leadoff homers in 2017... The only other Cubs player since 1946 to reach safely leading off seven-straight team games is Richie Ashburn, June 28-July 3, 1960... June 13-14 at Citi Field, he became the first Cub since at least 1920 to hit a home run to lead off a game in each of his first two career games batting leadoff … overall, he became the first player with a leadoff home run in each of his first two career leadoff starts since Arizona's Didi Gregorius on June 4 and 6, 2014 ... was the first Cubs player with consecutive leadoff homers since Tyler Colvin, July 23-24, 2010... June 13 at Citi Field, became the first Cubs first baseman to lead off a game with a home run since Rick Monday on September 11, 1976 at Philadelphia … thanks to Ed Hartig... Delivered a walk-off RBI single in the home opener, April 10 vs. the Dodgers … his single off Kenley Jansen gave Chicago a 3-2 win... Played 157 games at first base, recording a .998 fielding percentage (3 E/1,375 TC)... Ended the season on a career-high 138-game errorless streak at first base dating to April 25, surpassing Hall of Famer Ernie Banks and his 126-game errorless run at first base spanning 1969-70 seasons as the longest by a Cubs first baseman since at least the live ball era started in 1920... Also appeared as a second baseman in 10 contests, moving to that position when setting up for possible bunt and forgoing his first baseman mitt for a regular infielder glove... Made his first career appearances in left field and third base, not recording any fielding chances in two games... Went 5-for-37 with a double, homer, six RBI, two walks and one HBP in 10 postseason games. Anthony was named to his third-straight N.L. All-Star Team, voted by the fans as the squad's starting first baseman ... set career marks with a .292 average (170-for-583), 170 hits, 43 doubles and 109 RBI ... tied his career high with 32 homers, while putting up a .385 on-base percentage and a .544 slugging mark, good for a .929 OPS in 155 games ... Is the first Cub to make three-straight N.L. All-Star teams since Sammy Sosa made five consecutive, 1998-2002 ... Was awarded a Rawlings Gold Glove, the Rawlings Platinum Glove and a Louisville Silver Slugger award ... he joins Mark Grace and Derrek Lee as the only other Cubs first basemen to win either a Gold Glove or Silver Slugger award ... With 43 doubles and 32 homers, he is the first left-handed hitter in Cubs history to record 40 doubles and 30 homers in a season, and just the fourth overall ... he joins Rogers Hornsby in 1929, Derrek Lee in 2005 and Alfonso Soriano in 2007 ... Ranked second in the N.L. with 43 doubles (tied) and 109 RBI ... was third with 79 extra-base hits, seventh with a .544 slugging percentage, a .929 OPS and 317 total bases, eighth with 32 homers and 10th with a .385 on-base percentage ... Led all first baseman with 125 assists while his .996 fielding percentage (6 E/1,399 TC) ranked fifth in the N.L., leading to his Gold Glove plaudits ... Batted .277 (18-for-65) with five doubles, three homers, 10 RBI and 11 runs scored (tied for the most in one postseason in Cubs history) in 17 playoff games ... Collected 17 game-winning RBI, second-most in the N.L. (Nolan Arenado, 22) ... Had four multi-homer efforts: April 24 in Cincinnati, July 20 vs. the Mets, September 6 at Milwaukee and September 14 in St. Louis ... has 13 career two-homer games ... Matched career high with six RBI, April 7 in Arizona ... belted a three-run homer in the ninth ... Homered in three-straight games, April 20-22. Recorded his 10th career multi-homer effort, April 24 in Cincinnati, to give him eight home runs in the team's first 19 games ... Became the first Cub to hit eight blasts in the team's first 19 contests since Billy Williams did so in 1970 ... Collected 24 RBI in April, third-most by any Cub in that month, surpassed only by Derrek Lee's 28 RBI in 2005 and Billy Williams' 25 RBI in 1970 ... his eight April homers were surpassed in franchise annals only by Alfonso Soriano's 10 April long balls in 2011 ... Notched at least two extra-base hits in each of a three-game set in Pittsburgh, May 2-4 ... became the first Cub since Andre Dawson in May of 1989 to have multiple extra-base hits in each of three-consecutive wins on one road trip ... Amassed 11 homers and 35 RBI in the team's first 35 games through May 14 ... only five other Cubs players since 1920 - the first season RBI were compiled on official scores - hit that many homers and had that many RBIs in the team's first 35 games of the season: Hack Wilson in 1930, Billy Williams in 1970, Dave Kingman in 1979, Andre Dawson did it twice (1987 and 1990) and Sammy Sosa in 2000 ... Reached base safely in a career-high 26-straight games, April 15-May 14 ... Recorded his first career inside the park home run, June 29 in Cincinnati ... Recorded hits in eight-straight at-bats, July 9 and 10 in Pittsburgh, collecting four hits each game. w Became just the fourth Cub since 1913 with consecutive fourhit, two extra-base hit games ... joined Andre Dawson, Randy Jackson and Ripper Collins ... Made his first career appearance as a second baseman when he set up to field a possible bunt attempt, September 28 at Pittsburgh ... Went 7-for-14 with two doubles, two homers, three runs and five RBI in the final three games of the NLCS after going 2-for-26 in the first seven postseason games ... After going 0-for-4 in Game One of the World Series, he proceeded to tally a hit in Games Two through Seven, including a pair of multi-hit affairs ... Hit a two-out, two-run homer in the ninth inning of Game Six, while going 3-for-5 with three runs scored overall ... Scored a run in the 10th inning of the decisive Game Seven of the World Series, coming in on a Miguel Montero single. Again named to the N.L. All-Star Team, Anthony Rizzo collected 94 runs, 38 doubles, 31 homers, 101 RBI, 78 walks and 17 stolen bases to become just the sixth-left-handed hitter in major league history to reach those numbers in a single season ... he joins Babe Ruth (1921, 1923), Barry Bonds (1993, 1998), Ken Griffey, Jr. (1993), Larry Walker (1997) and Bobby Abreu (2001). Named a N.L. All-Star for the second-straight season, was the squad's starting designated hitter (0-for-2). w Was the first Cubs starting position player in the All-Star Game since outfielder Kosuke Fukudome and catcher Geovany Soto started in 2008. Reached 30 homers for the second-straight season, becoming just the second left-handed hitting Cub to reach that plateau in multiple campaigns ... joins Billy Williams, who reached 30 homers 13 times. Batted .278 (163-for-586) in 160 games on the season ... his 101 RBI ranked third in the N.L. while his 31 homers ranked sixth. Was hit by a pitch 30 times, tops in the bigs, and a franchise mark that surpassed 17 (Frank Chance in 1905, Marlon Byrd in 2010) ... most in the majors since Pittsburgh's Jason Kendall was hit 31 times in 1998. w Set the franchise mark for hit by pitches in April with six, surpassing Reed Johnson in 2008 (5). Became just the second 30-homer, 30-hit by pitch player in major league history, joining Boston's Don Baylor (31 HR, 35 HBP) in 1986. His .387 on-base percentage ranked fifth in the N.L. ... his .899 OPS ranked fourth and his 38 doubles tied for fifth. Hit .294 (48-for-163) with six homers, 25 RBI and a .409 on-base percentage against left-handed pitching ... that OBP was third-highest for any lefthanded hitter vs. a southpaw pitcher. Recorded 16 game-winning RBI, fourth-most in the N.L. ... his 72 extra-base hits ranked sixth in the N.L. His 17 steals were a career mark that surpassed his six in 2013 ... ranked second among first baseman, and the 17 swipes were the most by a Cubs first baseman since Leon Durham had 28 in 1982. Had two multi-homer efforts: June 5 in Washington and June 19 in Minnesota. Recorded a .994 fielding percentage (9 E/1,465 TC) in 160 games manning first base ... his 126 assists were second-most among big league first basemen (Joey Votto, 139) ... went 50-straight games without an error, May 26-July 24. Reached safely in his first four games of the season, giving him a career-high streak of reaching safely in 18-straight games dating to August 23 of the previous season ... tied that mark by reaching safely in 18-straight games, May 22-June 11. Matched his career high with his sixth stolen base, April 28 vs. Pittsburgh ... was the team's 19th game on the season. After hitting two homers in April, belted seven long balls in May, including six in 14 games, May 2-15. Matched his career high with six RBI, May 23 in Arizona ... delivered a three-run double in the fourth inning and hit a game-winning three-run homer in the ninth. w The homer snapped a stretch of 64 consecutive long balls with either none or one on base ... his previous homer with at least two on was September 16, 2012 vs. the Pirates, a grand slam. Recorded a career-high 12-game hitting streak, May 25-June 7 ... batted .386 (17-for-44) with seven doubles, a triple, two homers, six RBI and a 1.208 OPS during the run. Homered in four-straight games, July 29-August 1 ... marked the 26th time since 1914 that a Cub had turned the trick, and the first time since Alfonso Soriano, April 30-May 4, 2010. Tied his career high with four hits, August 4 in Pittsburgh. Belted his second career grand slam, September 4 vs. the Diamondbacks, off A.J. Schugel. Hit his 30th homer of the season, September 17 in Pittsburgh, off Charlie Morton. © Batted .188 (6-for-32) with two solo homers, two walks and one hit by pitch in nine post-season games. w Homered off the Cardinals Kevin Siegrist in both NLDS Games Three and Four ... it marked the first time in post-season history that a batter hit a homer off the same pitcher in consecutive games within one post-season series. Anthony was named to the N.L. All-Star team, his first career All-Star nod...Hit a career-high 32 home runs in 140 games to become just the seventh Cubs left-handed hitter to reach 32 homers in a season, and the first since Rick Monday hit 32 in 1976...All told, batted .286 (150-for-524) with 28 doubles, one triple, the 32 long balls and 78 RBI on the season...Won MLB's Final Vote for the 34th roster spot on the National League roster for the All-Star Game...Won with over 8.8 million votes...Became just the fourth Cubs first baseman to make the N.L. All-Star team in the last 32 years since 1982, joining Mark Grace (1993, 1995, 1997), Derrek Lee (2005, 2007) and Bryan LaHair (2012)...At age 24, became the youngest Cub to make the N.L. All-Star team as a first baseman...Phil Cavarretta, age 27 in 1944, was the previous youngest Cubs first baseman to earn the nod...His 32 home runs ranked second in the N.L., five behind Miami's Giancarlo Stanton...Became the first Cub to rank at least second in the N.L. in homers since Derrek Lee was second in 2005 with 46...His 150 hits marked a career high and surpassed his 141 hits in 2013...Ranked third in the N.L. with a .913 OPS and 30 go-ahead RBI...Was ninth with 73 free passes ...Tied for 10th with 89 runs and 61 extra-base hits...His 89 runs scored ranked second among N.L. first basemen ... his 61 extra-base hits and 73 walks ranked third, while his .286 average ranked fourth...Was hit by a pitch 15 times, tied for fifth-most among N.L. hitters...Batted .300 (42-for-140) with eight homers and 23 RBI against lefties ... his average against southpaws ranked fourth among N.L. left-handed hitters while he ranked second in homers (Philadelphia's Ryan Howard had 10)...Tied for the major league lead with 11 homers on the first pitch of an at-bat...Baltimore's Nelson Cruz also hit 11 such home runs...His 20 home runs prior to the All-Star break were the most by a Cubs left-handed batter since Rick Monday hit 21 before the Mid-Summer Classic in 1973...Had three multi-homer efforts to reach seven multi-homer career games: May 31 at Milwaukee, July 18 at Arizona and July 22 vs. San Diego...Tied his career high with four hits, April 9 vs. Pittsburgh...Drew four walks and hit a two-run homer, April 30 at Cincinnati … became the first Cub with a homer and four walks in a game since Hee-Seop Choi, April 16, 2003 vs. the Reds ... the four walks set a new career-high...Had a 56-game errorless streak from September 1, 2013-May 4, 2014 prior to a fielding miscue, May 5 vs. the White Sox … was the longest errorless streak by a Cubs first baseman since Derrek Lee's 59-game run in 2010...Belted a walk-off homer, June 6 vs. Miami … the blast came in the 13th inning off Kevin Slowey and gave Chicago a 5-3 win...Recorded a career-high 10-game hitting streak, July 11-25 .. hit .351 (13-for-37) with 12 runs, five home runs and a 1.226 OPS...Named N.L. Player of the Week for the period ending July 20 after hitting three homers in a three-game series at Arizona to start the second half of the season (.455/5-for-11)...Suffered a lower back strain, August 26 in Cincinnati ... missed the next 18 games...Returned to action with a bang, September 15 vs. Cincinnati, hitting a walk-off homer to lead off the ninth inning and break a scoreless tie. In his first full major league season, Anthony's 40 doubles were the most by a Cubs left-handed hitter since Mark Grace had 41 in 2000 ... his 65 extra-base hits were the team's most by a left-handed hitter since Grace had 65 in 1999... Batted .233 (141-for-606) with 40 doubles, two triples, 23 home runs, 71 runs scored and 80 RBI in 160 games... His 40 doubles and 65 extra-base hits both ranked fifth in the N.L... Led the team and ranked sixth in the N.L. with 76 walks... His .997 fielding percentage (5 E/1,441 TC) at first base ranked third in the N.L. ... his 0.6 WAR led all full-season first basemen... Batted .252 (105-for-416) with 16 home runs against right-handed pitching ... hit .189 (36-for-190) with seven homers vs. southpaws... His seven home runs against left-handed pitching were fourth-most among N.L. left-handed hitters, trailing only Jay Bruce (10), Joey Votto (9) and Carlos Gonzalez (8)... Hit .414 (41-for-99) with eight home runs when putting the first pitch in play... Led the team with 22 go-ahead RBI, 10 game-winning RBI and 29 RBI with two outs... Batted .257 (70-for-272) with runners on base, but just .191 (29-for-152) with runners in scoring position... Had three multi-homer games, bringing his career total to four ... hit two blasts April 26 in Miami, August 1 vs. the Dodgers and August 21 vs. Washington... Belted a home run on the first pitch he saw to begin the season, taking A.J. Burnett deep in the first inning on Opening Day in Pittsburgh... His multi-homer effort, April 26 in Miami, started a run in which he batted .390 (32-for-83) with 10 doubles, four homers, 16 RBI and a 1.103 OPS in 21 games through May 18... His eight April home runs are a franchise record for a Cubs left-handed hitter, surpassing seven by Billy Williams (1970) and Henry Rodriguez (2000)... The eight homers in April are tied for second-most by any Cubs hitter in franchise history … Alfonso Soriano hit 10 April home runs in 2011... Besides his eight April home runs, drove in 20 runs on the month, the second-most RBI by a Cubs left-handed hitter in April (Billy Williams, 25 in 1970)... Set a career high with three doubles, April 30 vs. the Padres... Reached base safely in a career-high 15-straight games from May 25-June 11... Set a career mark with four runs scored and drove in four runs, June 23 vs. Houston ... went 3-for-3 with a double and a homer... His .240 batting average (24-for-100) in September was 50 points higher than his .190 average (20-for-105) in August... Tied his career high with three walks, September 4 vs. the Marlins, done two other times... Played for Team Italy in the World Baseball Classic in March ... batted .235 with a .409 on-base percentage, two doubles and six RBI in five games ... helped the team reach the second round. Anthony, acquired from San Diego in January, made his Cubs debut, June 26, and went on to hit .285 (96-for-337) with 15 doubles, 15 home runs and 48 RBI in 87 games for Chicago ... his 48 RBI dating to June 26 led N.L. rookies while his 15 homers were tied for second-most ... combined for 38 homers and 110 RBI in 157 games between Chicago and Triple-A Iowa...Named the N.L. Rookie of the Month for July after hitting .330 (32-for-97) with seven home runs and 17 RBI....The seven home runs tied a Cubs rookie record for the month of July ... Gene Baker had seven home runs in July of 1954 ... the previous Cubs rookie to hit seven home runs in any month was Mel Hall, who hit nine in August of 1983....First player ever to have three game-winning RBI in his first five games with Chicago ... had four game-winning RBI in his first 10 games....Finished with eight game-winning RBI ... had 12 RBI with two outs in an inning....Made 85 starts at first base and recorded a .995 fielding percentage (4 E/735 TC)....Hit .318 (75-for-236) with 11 home runs against right-handed pitchers ... had a .208 average (21-for-101) with four homers against lefties....Averaged one RBI every 7.0 at-bats (48 RBI in 337 at-bats)....Had a career-high four hits twice: July 6 at the Mets and August 13 vs. Houston....Had a season-high, eight-game hitting streak from June 30-July 7 ... batted .424 (14-for-33) during the run....Belted his first home run as a Cub, June 30 vs. Houston, off J.A. Happ....Homered in four of five games, July 25-30, driving in 10 runs in that stretch....Belted his first-career walk-off home run, July 29 vs. St. Louis ... was a two-run, 10th-inning blast to give Chicago a 4-2 victory. ...Scored a run in six-straight games (seven runs total), September 2-7....Recorded his first-career multi-homer game and first-career grand slam, September 16 vs. Pittsburgh ... hit a two-run homer in the fifth and added the slam in the sixth....Finished the game with a career-high six RBI....Began the year with Triple-A Iowa and hit .342 (88-for-257) with 48 runs, 18 doubles, two triples, 23 homers, 62 RBI and 179 total bases in 70 games....Departed Triple-A ranked among Pacific Coast League leaders in nearly every offensive category, including home runs (first), OPS (first), total bases (first with 179), slugging percentage (first), RBI (third), batting average (sixth) and on-base percentage (ninth)....Named the Cubs Minor League Player of the Month in both April and May. Anthony began his fifth pro season with Triple-A Tucson, but made his major league debut in the first of two stints with thePadres during his lone year with the organization...made 37 starts for San Diego, all at first base...Had his contract selected by the Padres, June 9, and made his bigleague debut that night vs. Washington...collected his first career hitwith a triple in the fifth inning. At 21 years and 305 days, he was the youngest Padres player tomake his big league debut since Sean Burroughs did so in 2002(April 2 at 21 years and 202 days). With a triple for his first hit, he became the fourth Padre to triplein his first Big League game and first to do since teammate WillVenable (August 29, 2008 vs. Colorado)...Hit his first Major League home run, June 11 vs. Washington (off JohnLannan) with a solo shot in the second inning...Was optioned back to Tucson, July 22, but recalled for the remainder ofthe season, September 4...All told, batted .141 (18-for-128) with eight doubles, one triple, onehome run and nine RBI in 49 games for the Padres...Had a strong season with Triple-A Tucson, hitting .331 (118-for-356)with 34 doubles, 26 home runs and 101 RBI in 93 games...Led Tucson in home runs and RBI and ranked tied for the lead indoubles (with Aaron Cunningham)...His 101 RBI for Tucson ranked sixth-most in the Pacific Coast League,while his 26 home runs ranked eighth-most...Following the conclusion of the 2011 season, he was ranked as the No.5 prospect in the Pacific Coast League by Baseball America...At the time of having his contract selected, June 9, was hitting .365(73-for-200) with 20 doubles, one triple, 16 home runs, 63 RBI and 42runs scored in 52 games for Tucson. Was the Red Sox' Offensive Co-Player of the Year(Ryan Lavarnway) after leading the system with 25 home runsbetween Single-A Salem and Double-A Portland. ... Finished second in the organization with 100 RBI...also batted .260(138-for-531) with 42 doubles, 61 walks and 92 runs scored...loggedan .814 OPS. ... The first baseman was named Portland's Most Valuable Player and tied for the team lead with 20 home runs in just 107 games. ... Finished 11th in the Eastern League with a team-high .481 slugging percentage and set a franchise record with 32 RBIin August. ... Selected as the Eastern League Player of the Week for 8/2-8, batting .444 (12-for-27) with four doubles, three home runsand 12 RBI in that span. ... Tallied five homers and 20 RBI in 29 games with Salem and was leading the league with 17 extra-base hits (12 doubles,five home runs) at the time of his promotion to Portland on 5/10. Combined to lead Red Sox minor leaguers (min. 250 at-bats) with a .368 on-base percentage andranked among organizational leaders in batting (3rd, .297) and RBI (5th, 66) between Single-A Greenvilleand Single-A Salem. ... Tallied 12 homers, including nine with the Drive, where he was named a South Atlantic League All-Star. ... Finished 4th in the circuit with a .366 (26-for-71) average in June...ranked 5th in the league with 42 RBI and 3rd with 21doubles in the 1st half before a 6/24 promotion to Salem. ... Named Red Sox Defensive Player of the Month for July and was rated by managers as the Carolina League's bestdefensive first baseman. ... Missed from July 31-August 14 on the DL...hit .310 (9-for-29) in 6 playoff games for Salem. ... After the season, ranked by Baseball America as the No. 8 prospect, No. 6 position player, in the Red Sox system andas the Carolina League's No. 12 prospect. Was limited to 21 games from 4/3-26 with Single-A Greenville after being diagnosed with LimitedStage Classical Hodgkin's Lymphoma. ... Placed on the Temporarily Inactive List from 4/28-May 1...placed on the DL on 5/1 and missed the rest of the season. ... Ranked fourth in the South Atlantic League with a .373 (31-for-83) average in April...had multiple hits in 11 of 21 games,including 6 straight from 4/9-15 ... Posted a season-high, 11-game hit streak from 4/9-20. Made his pro debut with the Gulf Coast League Red Sox and reached safely in five of six games,going 6-for-21 (.286). ... Homered in his fourth pro at-bat on 8/21 vs. the GCL Twins. April 17, 2018 Chicago Cubs activated 1B Anthony Rizzo from the 10-day injured list. April 9, 2018 Chicago Cubs placed 1B Anthony Rizzo on the 10-day disabled list retroactive to April 6, 2018. Back injury. June 26, 2012 Chicago Cubs recalled Anthony Rizzo from Iowa Cubs. March 23, 2012 Chicago Cubs optioned Anthony Rizzo to Iowa Cubs. October 14, 2011 1B Anthony Rizzo assigned to Toros del Este. September 4, 2011 San Diego Padres recalled Anthony Rizzo from Tucson Padres. July 22, 2011 San Diego Padres optioned Anthony Rizzo to Tucson Padres. June 9, 2011 San Diego Padres selected the contract of Anthony Rizzo from Tucson Padres. 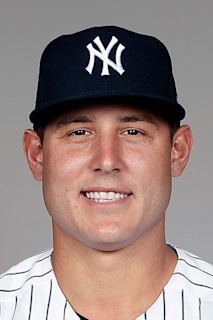 January 6, 2011 San Diego Padres invited non-roster 1B Anthony Rizzo to spring training. May 10, 2010 Anthony Rizzo assigned to Portland Sea Dogs from Salem Red Sox. March 16, 2010 1B Anthony Rizzo assigned to Boston Red Sox. August 14, 2009 Anthony Rizzo roster status changed by Salem Red Sox. August 3, 2009 Salem Red Sox placed 1B Anthony Rizzo on the 7-day disabled list. June 25, 2009 1B Anthony Rizzo assigned to Salem Red Sox from Greenville Drive.